The S3REGC10016T55ULP is a capless regulator circuit which has been designed to provide 0.8-3.0V with a load current of up to mA. The output voltage is programmable in 100mV steps. No external capacitor is required; the regulator's architecture has been designed so that it is stable without such an external capacitor, yet yielding a small area while consuming low ground current and allowing low-drop operation. The S3REGC10016T55ULP features an automatic feedback sensing option to maintain a constant regulated output voltage level. It has been designed to provide a stable output in both low-drop and high-drop operation, while maintaining minimum ripple on supply lines in the presence of large load current spikes inherent with switching loads, e.g. pipeline ADCs. 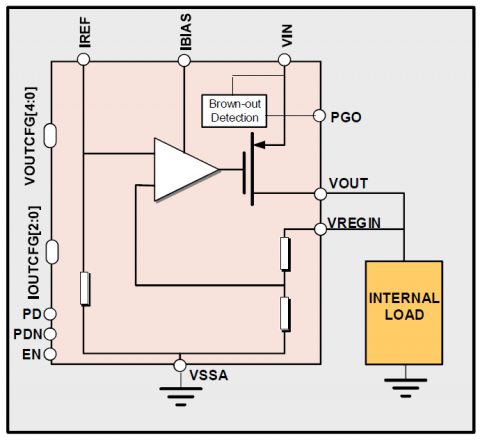 The S3REGC10016T55ULP includes a brownout detection (PGO) which detects when there is a temporary drop in supply voltage. As no external capacitor is needed, the S3REGC10016T55ULP regulator can provide savings in terms of package pins and discrete capacitors, allowing reduced BOM costs and higher system reliability. It can be particularly useful if the IC design is "pad limited". The S3REGC10016T55ULP is readily portable to any similar manufacturing process or can be customised for specific customer requirements and it's designed with Deep--Nwell process option.